This is the time of the year when librarians create lists of the best or recommended books of the year—from best picture book for children to best audiobook books for adults. And we’ll be highlighting many of these over the next few weeks. But here’s something completely new: a list of the essential cookbooks, suitable for both avid chefs as well as those just learning the rewards of making a meal. This was the first time the American Library Association ever created a list of recommended cookbooks, and I was happy to serve on the committee. And while it sounds like fun—and it was!—it was also lots of work. Cookbooks are really expanding, with hundreds being published each year, and many go well beyond just recipes to include cultural history or memoirs. Furthermore, we didn’t just read the cookbooks, but we actually cooked from them. How else can you tell if the recipes really worked? At least this year I have a professional excuse for gaining a few pounds over the holidays. To put a title on hold, simply click on the title or the book cover. Dinner Illustrated: 175 Meals Ready in 1 Hour or Less by America’s Test Kitchen. Bottom of the Pot: Persian Recipes and Stories by Naz Deravian. Everyday Dorie: The Way I Cook by Dorie Greenspan. Feast: Food of the Islamic World by Anissa Helou. Korean BBQ: Master Your Grill In Seven Sauces by Bill Kim with Chandra Ram. Sister Pie: The Recipes and Stories of a Big-Hearted Bakery in Detroit by Lisa Ludwinski. Matty Matheson: A Cookbook by Matty Matheson. Ottolenghi Simple: A Cookbook by Yotam Ottolenghi. Soul: A Chef’s Culinary Evolution in 150 Recipes by Todd Richards. Season: Big Flavors, Beautiful Food by Nik Sharma. Israeli Soul: Easy, Essential, Delicious by Michael Solomonov and Steven Cook. 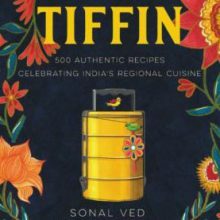 Tiffin: 500 Authentic Recipes Celebrating India's Regional Cuisine, edited by Sonal Ved.